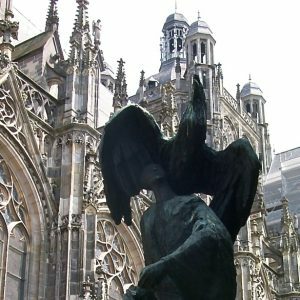 In 2016, in the Dutch city of ’s-Hertogenbosch or Den Bosch, one of the city’s most famous residents from the distant past is being commemorated. 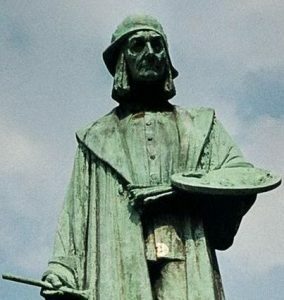 We are, of course, talking about the illustrious medieval artist Jheronimus van Aken, who died 500 years ago, in 1516, in his hometown. Hieronymus Bosch, as the artist is known today, was already a legend in his own time. The exhibition, Visions of a Genius, which closed in May of this year, was homage to his remarkable body of work, brought together from all over the world, covering his lifetime. Working in the Dutch province of Brabant, the native son of Den Bosch was familiar with works of art from both the southern as well as the northern regions of the country. He was influenced by the oak panels from the altarpieces of Geertgen tot Sint Jans, also known as Geertgen van Haarlem, and by Jan van Eyck’s masterpieces. 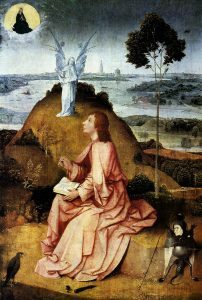 His admiration for their work can be seen in arguably one of his finest paintings, St John the Evangelist on Patmos, who was also the patron saint of ’s-Hertogenbosch. The portrait of St John situated in a detailed landscape is in the Gemäldegalerie, Staatlichen Museen zu Berlin at present. 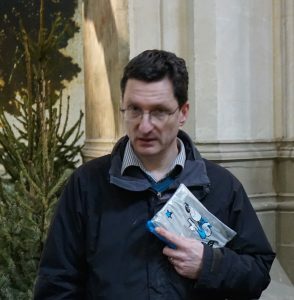 It is highly likely that it was one of two panels created for the altarpiece of the Brotherhood of Our Lady in the artist’s hometown cathedral, Sint-Janskerk. Clothed in a sumptuous red-orange robe, the evangelist looks up to a cloud wherein a woman, encircled by a halo-shaped sun, sits holding a child. He recognizes her as Mary, the Mother of God, who, in the last years of his life, he regarded as his mother. With a nod to Egon Sendler from his book translated from French; The Icon; Image of the Invisible, we can draw an invisible line between the two main characters of this scene and, halfway, an angel, nearly transparent, in grisaille. St John is further accompanied by a raven; seemingly a reference to Elijah who was fed by ravens in the desert. Looking to the raven, a typical Bosch demon-creature, half-man, half-beast, hovers in the bottom right-hand corner of the painting. The artist signed his name underneath. Is the placing of his signature a coincidence or is Bosch identifying himself with the fantastical chimera holding a spear at his side, and proffering a prophetic warning to viewers of the impending Last Judgment? Bosch, influenced by the time he lived in, was tormented by a profound awareness of sin and despised any form of hypocrisy. Justifiably, the painter can be considered as a surrealist painter avant la lettre. Although often seen in the ‘margins’ of art and architecture, the mysterious monster-like creatures and demons he painted appeared in various forms in Romanesque cathedrals and were often concealed in capitals and columns. The lack of restrictions by the powerful church authorities, allowed artists to give free reign to their imagination, however fantastical. This held true also for the creators of illuminated manuscripts. Hieronymus Bosch may have been familiar with these documents, many decorated with mysterious and imaginative, sometimes mischievous, demons and creatures lurking in the margins. There was a great interest in the Apocalypse and many believed these doomsday predictions which foretold the end of the world in the 1500s. 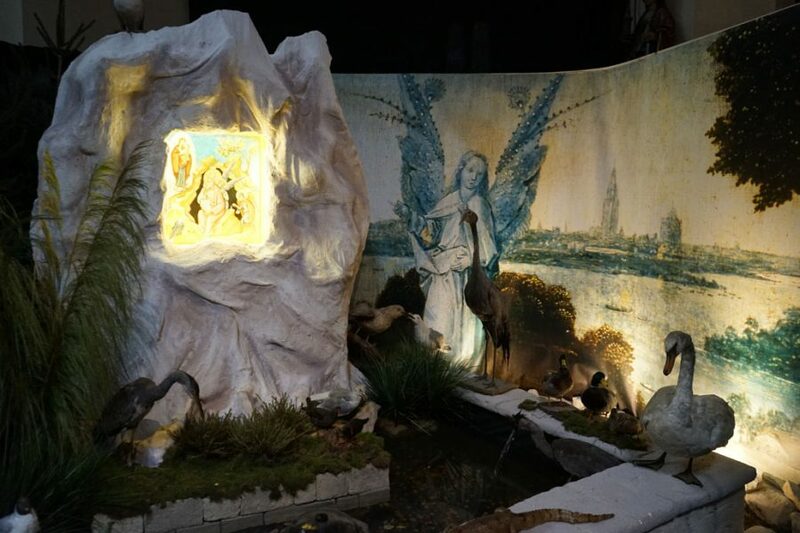 It would therefore not be surprising that Bosch’s strangely curious, sometimes puzzling and outlandish creatures were influenced by the religious climate of his time. Bosch’s hometown cathedral, St John’s, was the setting for an exhibition, God’s Love in Images, with twelve biblical scenes, one of which was dedicated to St John the Evangelist on Patmos. This scenario was also depicted in an eponymous icon written by Geert Hüsstege and placed in the same medieval surroundings as the Bosch painting. 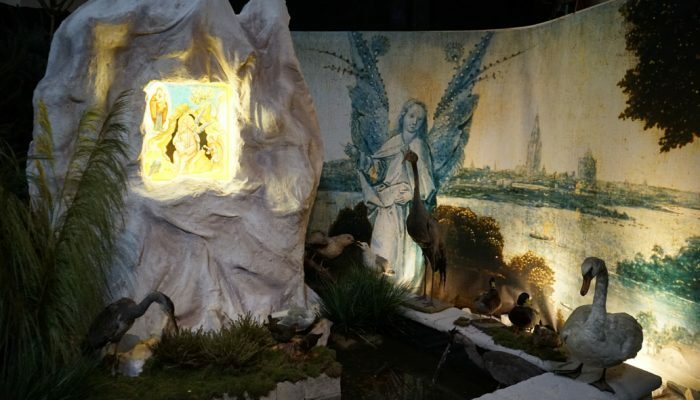 The Middle-Age landscape of ’s-Hertogenbosch formed a splendid totality with the contemporary icon and was a fitting tribute to the old master and his beloved city. And its placement in the cathedral was, indeed, serendipitous: directly behind the pillar where the father of Hieronymus Bosch, Anthonis van Aken, an artist in his own right, painted the fresco, The Tribe of Jesse. Art historians are trained to contrast and compare images and as with many professions, unconsciously, it becomes second nature to follow that instinct. What is striking is that Hieronymus Bosch and Geert Hüsstege not only share the same narrative and visual motifs – albeit details that sometimes compare and contrast – but more interesting is the manner in which the latter’s icon is painted. Remarkably, the medium of iconography – although much older in origin – possesses, by definition, a more abstract character than medieval paintings such as those from Hieronymus Bosch. Therefore it was entirely possible for Hüsstege to omit the naturalistic local landscape in the background of the Bosch painting and replace it with a lustrous, heavenly-blue backdrop. A painter of icons need not be concerned with portraying a foreground and background, a horizon where things appear smaller when they are further removed from the eye, a here and there or even a then and now. In point of fact, there is no ‘time’ in an icon:­ what you observe is made unequivocally present. In this way, Hüsstege brings the viewer closer to the Mother of God – because that is his aspiration – and makes her instantly recognizable through the fertile and prolific language of icons. Another special feature is how the icon painter plucked Bosch’s translucent angel from the mountain and placed the figure directly behind the evangelist. This rendering is more faithful to the scriptures and reflects what is observed in the myriad icons of St John the Evangelist and his revelations. It also dictated what he passed on to his pupil, Prochoros. In Hüsstege’s skilled hands, Hieronymus Bosch’s fantasy creature is transformed into St Michael the Archangel, who was given the task to weigh souls on the scales of justice on Judgment Day. Bosch’s raven is replaced by an eagle, a symbol from Christianity, who presents a quill to the evangelist. The poplar tree in his icon appears to being bowing to St John’s visionary Mother of God as well as to the Christ Child she embraces.